For some reason (maybe as a testimony to the wisdom of record executives), Larry Garner’s You Need To Live A Little is no longer in print. This is a shame, because it is his best recording, which is really saying something given his outstanding body of work. 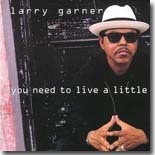 For most listeners in the U.S., this was their first exposure to Garner since this was his first release on a U.S. label (PolyGram’s Verve subsidiary), though he had recorded a couple of classics for JSP in the early ’90s. A Baton Rouge resident, Garner was inspired by local bluesmen like Silas Hogan, Guitar Kelly, and Clarence Edwards. He learned to play guitar from some of his relatives, but ended up in Korea, serving in the military. When he returned home, he played music part-time while working at Dow Chemical for nearly 20 years. After retiring from Dow, he took up music as a full-time job. He was a hit overseas long before the word got back to America, as he completed several successful European tours in conjunction with the two JSP releases (Double Dues and Too Blues). With You Need To Live A Little, domestic fans got to see what all the fuss was about. Garner’s songwriting skills are impressive. His Blues are contemporary, whether he’s facing the problems that come with having teenage children (“Four Cars Running”), dealing with neighborhood gossip (“Don’t Run Talking”), stepping out (“Someone New”), making a change in lifestyle (“Had To Quit Drinking”), or just facing the travails of everyday life (“Another Bad Day”). For the Everyman, all of these issues are a way of life, and no one today has their finger on the pulse of the Everyman like Garner does. Garner also pays tribute to his influences, with a splendid remake of Silas Hogan’s “Rats & Roaches In My Kitchen,” assisted by Sonny Landreth’s gorgeous slide guitar, and “Keep On Playing The Blues,” which honors Bluesmen past and present. “Miracles of Time” is a soul/pop ballad, and the title cut is a jazzy word of encouragement to those mired in work and misery. “The Preacher Man” is a searing indictment of those who hide their misdeeds behind religion. “Nobody’s Special” is reminiscent of the “talking blues” songs he did on his first couple of releases, and the funky “Shak Bully” is actually a remake of a song from Too Blues. Garner’s guitar work is flashy, but concise. His vocals are warm and friendly. The musicians on hand include Landreth, Willie Weeks (bass), David Torkanowsky (keyboards), Kip Bacque (guitar), Brian Jones (drums), Richard Comeaux (steel guitar), and the White Trash Horns. Garner’s tenure with PolyGram was somewhat checkered. His follow-up, Baton Rouge, was only released in Europe (but picked up by Evidence in 1999). He later signed with Ruf and released a couple of nice studio CDs, plus a live release, all of which were available domestically. He recovered from successful triple bypass surgery a couple of years ago and recently released a new disc that’s, of course, only available overseas. It might take a little effort to find You Need To Live A Little, but it’s well worth seeking out.